« Good Fishing For The Hardy Fishers! The weather came through pretty good this weekend. Sunshine and 40s both Saturday and Sunday. Temperatures look like they are going to be pretty good most of this coming week. However, there is a chance of showers moving in tomorrow night. Tuesday looks like overcast with chances of showers again on Wednesday. But, the Wednesday temperatures look like they will be in the mid 50s. Thursday, more sunshine and back to rain chances Friday. What can I say about the generation. As projected all last week, they generated all day, every day. The projection for Saturday and Sunday was to turn the generators off late morning for 6-7 hours. On Saturday they had the generators off for a while early in the morning. When they turned them on, they stayed on the rest of the day…no they turned them off around 10:00 p.m. Sunday, they had the generators off until 6:00 a.m. then two on until noon and then off until 5:00 p.m. Tomorrow’s projection is similar to today. The Louisiana Kerrs fished with Darrell and Carolyn Saturday. Good day on the water. As I said earlier, the weather was really nice this weekend. Darrel had the guys, Albert and James Albert. They had a good day on the red San Juan worm. Carolyn and Dawn did not get on the water until noon, but we had a very good day too. Best on the big Ruby midge with the red San Juan Worm dropper. Caught a few pulling the sculpin and were very disappointed that they were not hitting the Big Ugly on the high bank. Oh well, there will be another day. Great weather, lots of fish, and a good time. Sunday, Carolyn introduced a mother and her daughter to fly fishing. Rayetta and her daughter, Abigail, are from Sulphur Springs, AR. Abigail is quite the young outdoors lady. She is into trap shooting, hunting, archery, regular fishing, and now, fly fishing. We worked on the regular stuff, rolll cast, pick up and lay down cast, knots, hooking and playing fish. Still need to do some more work on casting….don’t we all?…but the hooking and catching came pretty easy. They caught fish on the copper dun midge and a small sculpin. Rayetta really liked the casting and stripping. Think we might have another stripper on the water! Abigail said she lost count of the number of fish she caught. Forgot to mention, I spoke with the folks at the Hatchery this week about the turn over of Table Rock Lake and they responded that the lake is in the process of turning. I were wondering as we have noticed the lake is a little off colored. Did use the cerise San Juan worm Saturday and it worked well, but a one of the two guys who were staying in one of our cabins fished the cerise worm all day Saturday and had a great day on this pattern. 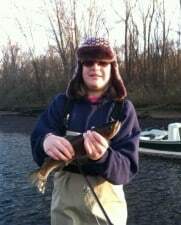 This entry was posted on Sunday, December 11th, 2011 at 9:07 pm	and is filed under Fishing Reports. You can follow any responses to this entry through the RSS 2.0 feed. You can leave a response, or trackback from your own site.